Captain Marvel is an okay entry into the Marvel Cinematic Universe. It does a good job of reminding us it is part of this universe more than it tells us about Captain Marvel. Before the movie released, people were complaining about the actress. The problem with Captain Marvel has less to do with acting/actress and more to do with overall story/plot. It feels like an obvious piece of the larger MCU more than a standalone movie. It is a bridge between Avengers 3 & 4, the character having been “introduced” in 3’s credit scene, and it contains more than enough components that are best understood if you’ve seen enough of the 20 other films. (I haven’t seen them all.) While it’s building this connection to the rest of the universe, not a whole lot more is known about the character by the end of the movie than at/near the beginning. I get these movies are all part of one universe, but a self-contained story on its characters is doable (see: Black Panther, Ant-Man, or Guardians of the Galaxy), especially if it’s an origin story. However, Captain Marvel doesn’t spend enough time explaining/developing certain plot points without moving on, but it repeatedly lets the viewer know it’s part of the MCU, serving as a reminder all these movies are somehow connected. This includes, but is not limited to, having a major character from a “future” movie playing a minimal roles in this movie (Ronan) and revealing Cap’s powers originated from the Tesseract (because why not). We even see how Nick Fury loses his eye (“Cat Scratch Fever”? Seriously? Why?) and comes up with the name for Avengers Initiative… bits that are minor to the movie and maybe minor to the overall MCU. Seriously, if we never found out exactly how he lost/injured his eye or decided on Avengers Initiative, there would be no impact on the bigger picture. Maybe the only thing that had significance was how he got the pager, since it was the key to the lock. On the other hand, there are certain elements of this movie left unexplained or that felt unnecessary. How/why did Carol lose her memory after she gets her powers? (Other than we get to learn as she learns through chopped memory sequences, making her origin story Bourne Identity meets Luke Cage)*. Why did Dr. Lawson/Mar-Vell change sides? The first half of the movie spends so much time focused on finding her to advance the plot, but then we learn she’s not really fighting with the Kree. Or is she? Was she fighting against her people the whole time? Did she learn something that made her switch sides? All we get is “here’s a disc so you’ll stop attacking us” and blind acceptance to what the Skrull leader says. This could’ve been resolved by the hidden Skrull revealing in a few lines why she hadn’t been working with the Kree, but by then it’s forgotten. I mentioned the cat, which was basically a plot device, showing up inexplicably in multiple scenes until the one scene it’s revealed the cat is not really a cat. Instead it’s really a tentacle-mouthed creature that can eat the Tesseract, the MCU MacGuffin that can’t be touched by human hands. (For the uninitiated like me, Google explains this “cat” is something called a flerken… I think it’s Kree/Skrull for “plot device.”) I suspected early on it wasn’t just a cat, since it did keep showing up, so the reveal was bizarre but anticlimactic, as if they just needed to wrap up the story and relocate the Tesseract for “future” MCU purposes. (End credit scene shows it coughed up, conveniently tying up another loose end.) Then the cat suddenly scratches Nick Fury, just so we can have an answer to how he got his eye messed up… was it surgically removed after this? It was just a scratch, right? Not a clawing out? Why did it even turn on him? Don’t get me wrong. I didn’t hate this movie, but there was nothing that particularly stood out to make this movie its own story apart from being a part of the MCU. 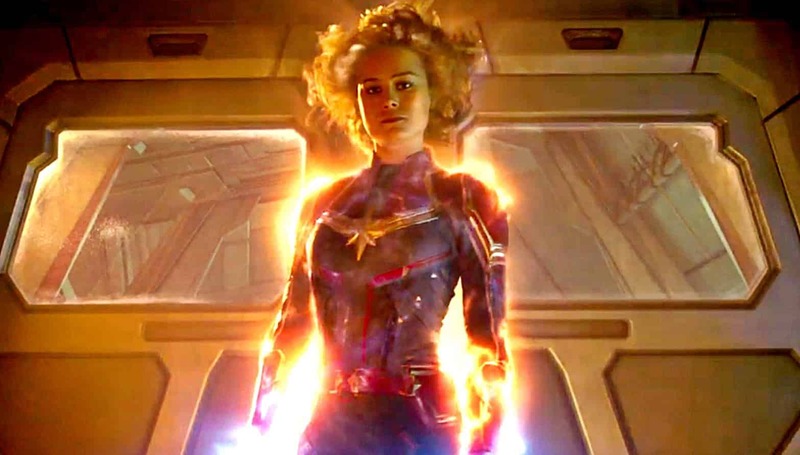 Since it is less of a straightforward narrative and more of choppily digging through memories (Carol’s and the MCU’s), it’s difficult to get a sense of who the character is or why I should care. As someone who knows little about the character, I would’ve liked to learn something about her that makes her who she is and not just another cog in the machine. It seemed more of a CliffsNotes version of Captain Marvel’s power (and maybe Nick Fury) to set up the next MCU domino than much of anything else. I didn’t know what to expect from the movie going in (other than 90s nostalgia from the trailers). I mainly went to see it because of its place between the Avengers 3 & 4, but I thought this would tell me something about the character. However, I feel as if I could probably watch the next installment without having watched this one and not have missed anything important. I guess we’ll see if there was any payoff when Avengers 4 rolls out next month. *Forgetful character trying to remember. Flashback reveals overdose of power source leading to invulnerability.